Noted love that eight-day-old white lion cub to cute, great pics..thanks Giana! Loved the 1st picture also. I also loved the youths playing hockey on unicycles, and the one of cycling across the Hudson. These were all very amazing photos...some very dramatic. Interesting photography. Colourful and fascinating. 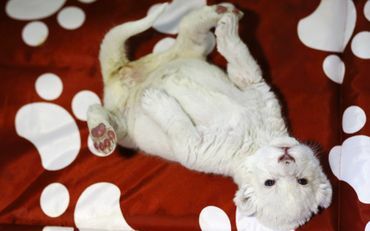 "An eight-day-old white lion cub plays at Belgrade's 'Good hope garden' zoo. The female white lion cub, still unnamed, was born eight days ago to parents Masha and Wambo. A male was also born but died. Belgrade zoo has a total of 11 white lions, which are extinct in the wild and are found only in zoos and reservations. It is estimated that there are around 500 living in captivity around the world.